Stepan was born at the 27 week gestation. For seven days the boy was connected to a ventilator. 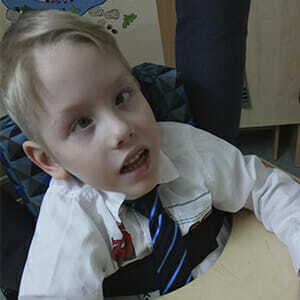 Later Stepan was diagnosed with cerebral palsy, spastic tetraparesis, convulsive disorder, esotropia. The boy can roll over and tries to crawl, he also understands the speech addressed to him. “I am a single mother. Because of the motor disabilities and convulsive disorder, we don’t have the possibility to go to the kindergarten. We were offered to stay at the development and rehabilitation center for children, but only until lunch. As a result I had to quit my job”. Medication and individual classes are necessary for the boy, but it costs too much for the family. Two years ago the Stepan was given a wheelchair, but it was too heavy and cumbrous. With the help of the “Children’s Hope Workshop” the family has bought the wheelchair, that was adjusted for the child’s individual needs.